Thus far the year has been rather productive. Quietly behind the scenes we've been laying the groundwork for greater plans later this year regarding Vulne Pro's creative efforts and the TKP project continuing forward. Moving along into the year it's time to ramp things up. With the recent posting of an updated design for Gumbinnen Sems on Deviant Art I thought it would be of interest to go into the origin of the sendai; the bio-mechanical characters that populate universe of Theos KE Polemos along with their human creators. What makes the posting of the new Gumbinnen design noteworthy is that Gumbinnen "Gumbee" Sems is the very first sendai design I created. His origin and evolution is theirs. Examples of the early Gumbinnen designs are peppered throughout this post. 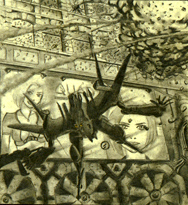 The 1990 original design can be seen in the collection to the above right. 1990 The first sendai "Gumbee"
The original Gumbinnen was something I drew way back in 1990, when I was 19. I became interested in mecha when my Father bought me some of the Robotech kits in 84. The following year Robotech debuted on TV. It was my familiarity of the kits that compelled me to watch the show, Macross (yes Robotech-ized but Macross was the least changed of the 3 shows they joined together) was what kept me watching even though there were no Dougram or Orguss bots anywhere to be seen in the animation. The show and this new (to me and many who tuned in at the time) form of animated storytelling from Japan cemented my interest in robots conceptually for good. The show also began my interest in animation as a storytelling medium. From that point on I began drawing my own robotic creations (and pretty much anything else conceivable in world building) and have been doing so ever since. Most of those early creations weren't worth noting. It wasn't until the 90s that, you could say, I came into a discernible style that was my own visual voice coming through beyond any influences I had at the time. 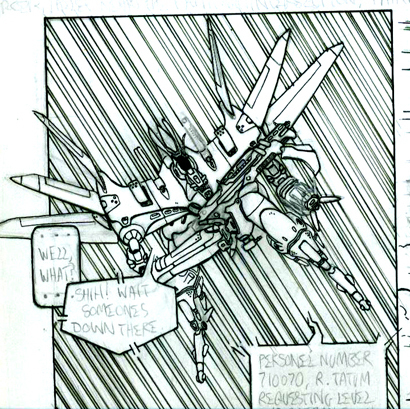 It was then that early traces of my current signature style with mecha were beginning to come into focus. 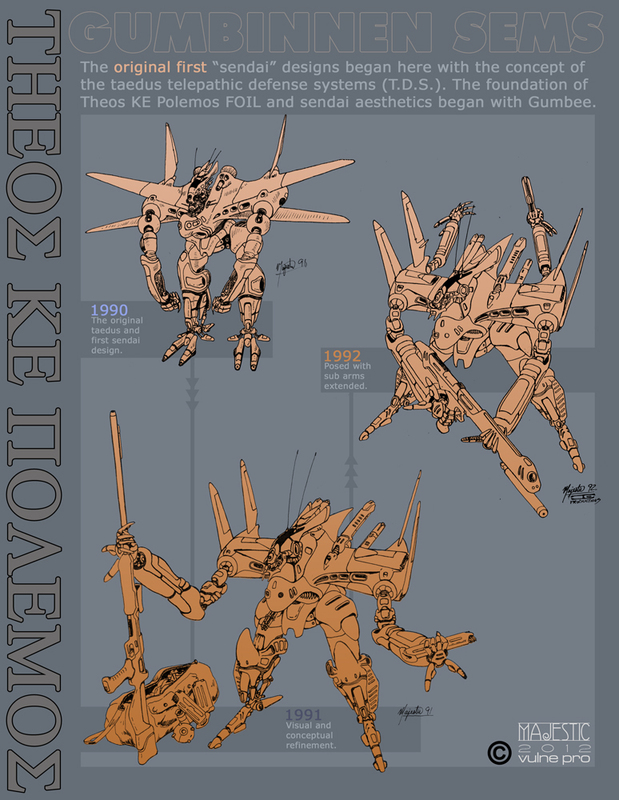 However Gumbee wasn't part of Theos KE Polemos at that time because Theos didn't actually exist in 1990... at least not in the form it does now. A project created in roughly 1988 to 89 (the precise dates on this elude me) by Steve Loveland (a close friend I've known since grade school) and myself called 'Earth don't Work with Peanut Butter in the Gears' was to become the foundation that many concepts later appearing in Theos KE Polemos came from. A dramady, of sorts, "Peanut Butter" (clearly some comedy in the absurd title) featured detective characters and their bio-mechanical partners called taedus, or taedai in the plural, inhabiting a rather film noir urban setting. Also we came up with SADUS (Self Aware Defense Utility System) and SACUS (Self Aware Civilian Utility System) which were, more or less, sendai as well. It is from the plural taedai that, later I came up with the sendai descriptive of all TKP bio-mechanicals evolved from. It was not intended as reference to the Japanese city of Sendai it simply seemed to fit the fictional entomology that favored dai as a suffix. We may have been young but the ideas we came up with were generally well thought out and some of the core foundations survive today. They were actually solid enough concepts worthy of developing further. Here in the "Peanut Butter" material, and Gumbinnen's creation, we can see some familiar TKP elements already. Both Steve and I developed the various "gear" and tech Gumbinnen's design employed along with ideas that form much of the bedrock for the sendai in Theos. 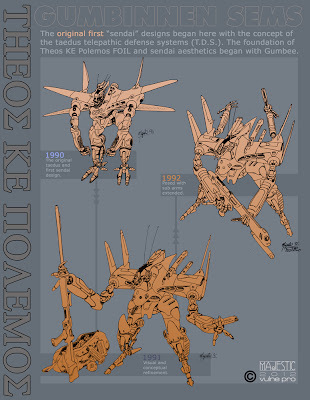 There's no question the popular mecha works of the classic 80s anime such as; Zeta Gundam, Macross, Votoms, Layzner, Dragonar 1, Crusher Joe, etc, along with Masamune Shirow's manga Appleseed had some influence on these early designs. In fact if there's any old school mecha designs I can cite as having the most direct inspiration for the direction I took with Gumbinnen it was Cruise Chaser Blassty's wild bots designed by Akitaka Mika. There were a pair of designs from Blassty; Areld and Knock Turn that had an air-frame/formula-one-ish vibe to their aesthetics. I, in turn, took a cue from that and went to WWII aircraft for my own aesthetics inspirations going more organic, rounded shapes, etc. What I did with Gumbee went its own visual direction but, from what I recall, I believe it was Blassty that inspired that path to a degree. I feel credit where credit is due. Granted, at the time, I personally don't feel I had anywhere near the chops Mr. Akitaka had. However I think it might have actually been my lack of experience, and dogged desire to do my original own thing, (and this goes for Steve as well at the time) that made the Gumbee design pretty different, even citing what inspired it. Additionally if there was any animated film I could cite for my committing to a path of original works and unique visual world design (and I've cited it before) it would be Gainax's debut film: 'Royal Space Force: The Wings of Honnêamise'. That film really fired my imagination toward creating original content with emphasis on strong unified art direction and it still does. The film was a labor of love for those young artists that created it, it pours from every frame. That kind of creativity is exciting to me. Though the film wasn't a success upon release it has since become a cult classic and like many other cult films is recognized now for the landmark work it was. Very little is created in a total vacuum, it always comes from somewhere. As an artist it's your job to bring your own personal perspectives to the table allowing your own distinct voice to come through. How you discover an original voice is in finding your own unique ways to express what has already been done... because pretty much everything has been done before. I still am very much committed to original works but always put this into perspective. Influences and inspirations are always going to be there but for me, personally, it's far more fun to work toward something you haven't quite seen, even when quoting from established aesthetics and rules. It really is kinda like jamming in music, getting in the grove once you know the musical language. Designing a robot is no different in many ways, learn the language, create your own language, begin constructing your own riffs, and get in the groove. All said back then we were ultimately forging our own creative path fiercely committed to being as original and true to ourselves as we could be. During that time it was the bold creativity on display in much of the classic 80s anime (visually and on occasion in narrative, though there was crap made back then too for some perspective here) that made it so inspiring. It drove us to push our own boundaries and much of the "Peanut Butter" material was rather unique for it. 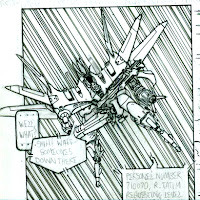 There was no internet at the time to learn from others, post and share art, "google" ideas, nobody to teach you this stuff (mecha design). You had to figure it out on your own, study and learn from art books, magazines (Animedia, Animage, Hobby Japan), whatever. That seeming new frontier of creativity was what attracted me to anime as a medium, not an excuse to simply consume it as a fan. There's nothing wrong with being a fan but if you have the means and desire to create then you're no longer in need to simply consume, go forth and create. A lot of wild ideas evolved with the Peanut Butter project and one that is very familiar to those following Theos are the sendai, which FOILs ultimately are a part of. Gumbinnen, as a design (not in context of the story his creation is part of the 5th gen period which is late in the timeline) is the very first taedus, and thus the first sendai. Scenes above of Remindeff (Heath Wuthering) and Gumbinnen asleep on the job. Yes, that is real zip-a-tone (note the yellowing on the zip these are old pages after all). To the left a shot of Gumbinnen in flight with an assault shettier, of some kind, at the ready. More sample images, to the lower right, from an unfinished 'Peanut Butter' comic titled 'Port Sylvane'. Circa roughly 1993 or so. The comic was a 23 page short story featuring Gumbee and his partner Remindeff Willoughby (Heath Wuthering) called in, by the Genuaä Policers, to assist in diffusing a potentially volatile political situation from unfolding. A special investigations task force, headed by a fellow Genuaä policer, is in pursuit of illegal cyborgs (Hudai in TKP) and things get out of hand from there. The comic was unfinished due to various circumstances and the impetuousness of youth. The eagle eyed may note the bottom frame from a certain TKP image art piece that I did as an updated version of this shot. After Port Sylvane I took a hiatus from the material for 7 years to pursue music recording and continued studies of fine art. I didn't revisit The "Peanut Butter" material until late 1999-early 2000. It was roughly around this time that the nascent ideas that were to evolve into Theos KE Polemos began rolling around in my head. As the new millennium was approaching along with epic biblical apocalypse, Y2K, and whatever absurd doom of the world nonsense was bearing down on us I kept having ideas flooding my brain regarding the "Peanut Butter" characters and settings, the ideas were too compelling not to return. It became apparent I needed to begin to crystallize some of these ideas so, along with a lot of writing and brainstorming, I drew Beyond Reach. 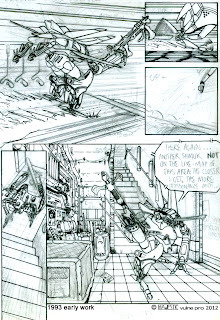 Scenes from the six page 'Beyond Reach' short from early 1999. It was made as a test for the pencil style it employed and to show as portfolio content. The story was pre-Theos KE Polemos but essentially Indus in setting and TKP in content. Beyond Reach was an older take on the Badan Song material (which will be coming to light more and more) featuring Gumbinnen as a central character during a series of escalating events threatening his home of Genuaä in the architectural hall of mirrors that is the planet Indus. So clearly those core elements from the older work were evolving. The six pages were entirely traditional media, all pencil shaded with polyurethane coating to deepen contrasts and age the paper (the yellow/sepia look is not Photoshop but the result of using this approach). Though the current narrative of Badan Song has some rather significant changes the core elements of plot have remained and come from this early take on the material. The first two pages feature Gumbinnen pursuing an out of control sendai from the political bloc of Gërmane. In the scene to the left a Gërmane roundhead is shooting the living crap out of the roof of an Indus wallrider. The polyurethane look does have a distinct atmosphere and carried the film noir thematic well. The pages generated a lot of interest during my attendance of various comic cons at the time. The reactions I had been getting seemed to be rather consistent; a visual style of anime mixed with Heavy Metal (Metal Hurlant) which I kinda took a small amount of pride in simply because I wasn't trying to just copy anime, I was doing my own thing. Although I wasn't influenced directly by European comics at the time I can understand why people had those impressions my visual sensibilities were probably closer to that aesthetic to some degree on this work. It's been several years since I last cracked out the polyurethane... something tells me I'll be doing so again soon. I really love working with it. 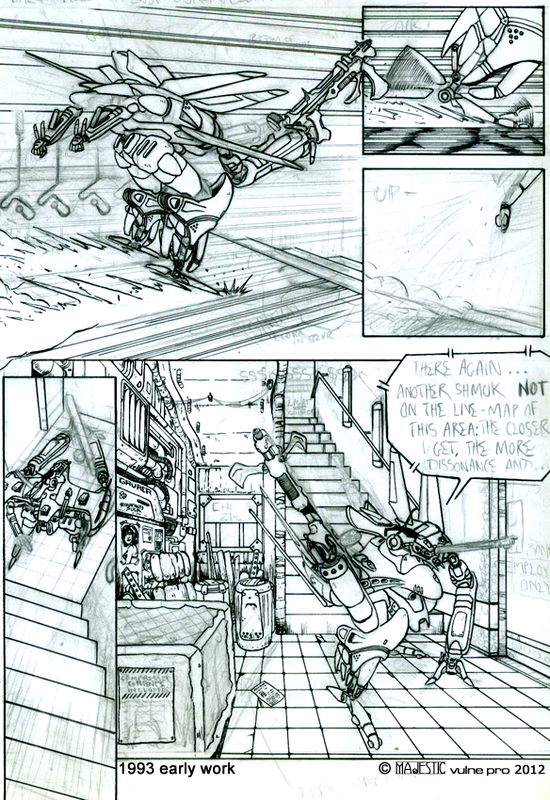 These pages were also partly responsible for my working for Dremwave comics for a time. I had originally been tapped to draw Transformers and there were even talks about possibly doing Badan Song for them. Thankfully it didn't work out that way and I ended up doing colors on Transformers for a year. Why, thankfully? Because Dreamwave folded in a somewhat messy flame-out and I would have had to compromise the material significantly potentially surrendering the I.P. to them fully (every "original" book they put out was "created by" Pat Lee and TKP is NOT by Pat Lee with due respect). I wisely, and quietly, left on good terms fully paid before that happened because I could see the writing on the wall. I believe it was a month or two after I left that they folded. The Beyond Reach short was just part of my returning to the characters and designs I had so much fun with creating as a teen. During this time reacquainting myself with these concepts a little something involving FOILs would begin to evolve and grow into a considerable project as well. You all are pretty familiar with that work by now. I hope those of you following this project will find this walk down memory lane interesting. Very interesting post, Mike. It's cool to read about your influences. I recall those early years, too, and how fresh and different (to us in the West) those Japanese imports seemed, both the model kits and the animation. Thank for the comments Tom! Yeah those were pretty unique times which is why folks tend to have fonder memories of the "old school", everything was so fresh and new then. I think keeping that spirit alive while forging ahead into new uncharted territory is not a bad way to go though. My thanks on the offer regarding screentones, I would likely use them even though a lot of that can be done digitally now. I have a box with a small amount of my left over screens from the 90s myself.